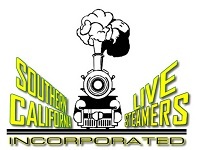 Friends of SCLS | Southern California Live Steamers, Inc. Donations of $100 or more will automatically receive a Charitable Contribution Acknowledgement Letter from SCLS. In order to expedite our acknowledgement of your donation and to save on postage cost, please provide us with your e-mail address when sending your donation and we will e-mail the acknowledgement letter within 60 days.